Believe it or not, you can make a pesto out of just about any leafy fresh herb. 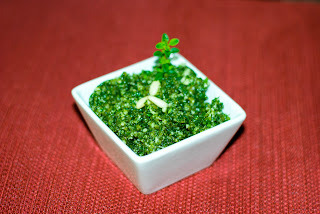 Here, I had an abundance of lemon thyme in my mini garden and experimented with this recipe. Lemon thyme has a sweet and lemony flavor which is light, so it’s great to use with poultry, fish, pasta or sauces. Pesto is so simple and quick to make. Just pop all of your ingredients into your food processor and in 5 minutes you have fresh pesto you can use in your recipes. This one I used in some risotto (recipe to follow!). 1. Add the thyme, garlic, nuts and cheese to a food processor or blender and pulse until well blended. 2. Next, gradually add the oil until the mixture forms resembles a paste-like consistency. 3. Use immediately or store in an air tight container in the freezer for later use. Makes 1/2 cup. *Calculations based on ingredients entered into CalorieCount and may not be 100% accurate. This was the first year I’ve cooked with it and I really enjoyed the light, lemony flavor it brings to delicate dishes.